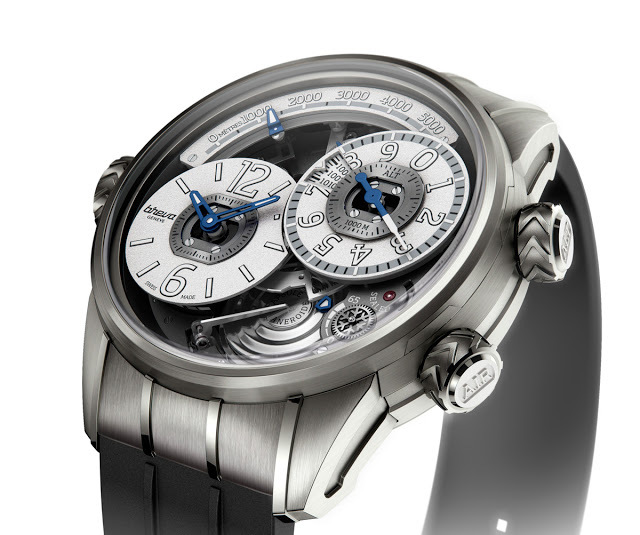 Breva has just unveiled its second wristwatch, the Genie 02 Terre in titanium. Equipped with a mechanical altimeter that can measure up to 5000 m or 16,400 ft, the movement of the Genie 02 Terre was developed by Jean-François Mojon of Chronode. 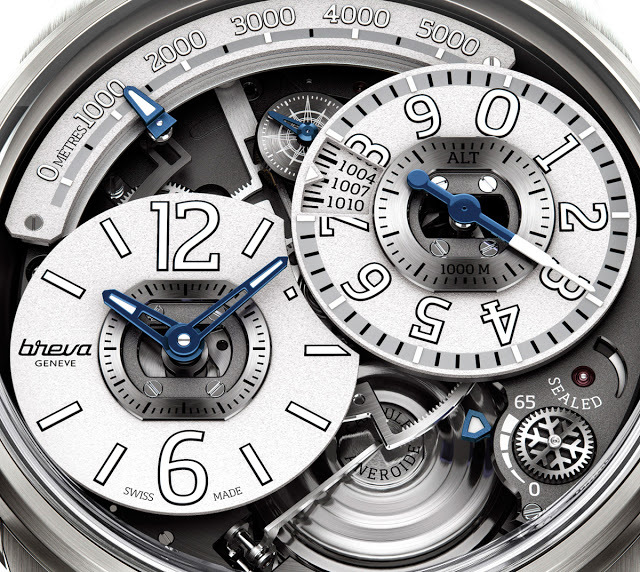 At its debut in Baselworld 2013, Breva presented its first wristwatch, the $170,000 Genie 01, powered by a movement from technical specialist Chronode. The titanium Genie 02 Terre is a more accessibly priced variant of the same movement, and is equipped with a built-in altimeter which can measure altitudes of up to 5000 m or 16,400 ft. That is accomplished by measuring the air pressure with a pair of aneroid capsules, visible on the dial at five o’clock. In order to measure altitude, air pressure inside the watch has to be equalised by opening the valve in the case at four o’clock, and then calibrating the watch to a known altitude or air pressure. The Genie 02 Terre is available with the altitude display either in metres or in feet. Altitude is indicated in thousands of metres on the on the top edge of the dial, and in hundreds of metres on the sub-dial at two o’clock. 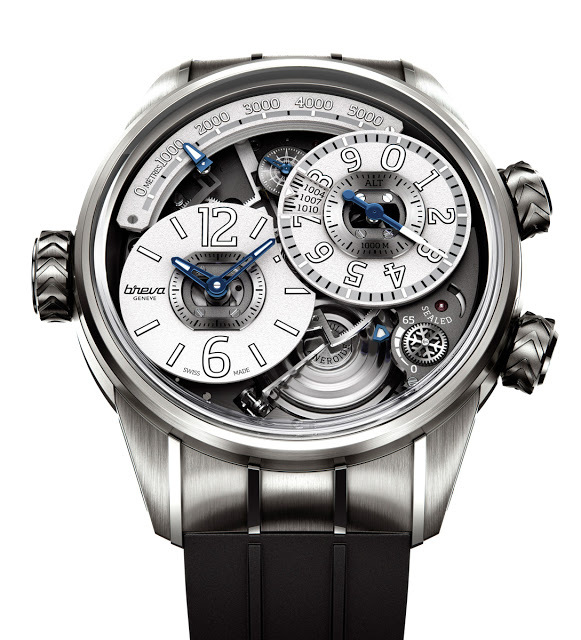 In this image the altitude is approximately 1300 m.
And the smaller display integrated into the sub-dial at two o’clock shows air pressure in hectopascals (hPa); above it reads 1007 hPa. Time is displayed at eight o’clock, with the seconds at four. Just besides the seconds counter is the power reserve display, which tops out at 65 hours. The Genie 02 Terre has a 44.7 mm case in titanium, with a rubber strap. It’s limited to 55 pieces and the retail price of the Genie 02 Terre is as follows, in the respective currencies for each country: US$132,000, €97,500 and 168,000 Singapore dollars. Follow us on Facebook, Instagram and Twitter for updates and news.